I have found that the Bloody A60 gaming mouse has a spectacular response time and absolutely more than meets the title of fastest response time. 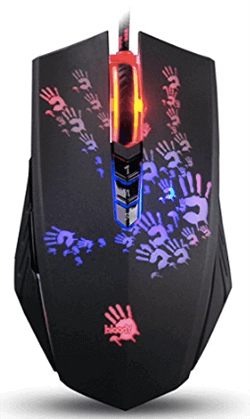 With 4000CPI this hard-core gaming mouse will have you speeding across any screen size. This is alongside an infrared scroll wheel which means that not only does the Bloody A60 have the fast response time when moving, but also the fastest response time when clicking. This is all coupled with a unique light strike switch which will give you an awesome minimum of 0.2MS response. An essential tactical advantage in any high kill gaming environment. Aided by the Avago 3050 Gaming Laser Engine the Bloody A60 had no difficulty in gliding across my desk surface with smoothly precision and lethal intent. To my pleasure, I also discovered that my gaming lethal intent could be customized with four levels of DPI settings: 800, 1000, 1200, 1600, 4000. Meaning that any speed was possible! TheBloody A60 gaming mouse also has a very powerful five pre-set settings allowing vastly customizable dpi settings ranging from the snail slow to lightning fast. Which means that one can customize it to fit any game, any gaming style and anyone’s reflex speed. The included software also aids in developing advanced macros for more efficient gaming. My first impression on plugging it in was that someone had left hand prints on theBloody A60, but that was just the funky lighting effect which I grew to love as an awesome addition to my desk. TheBloody A60 has a very solid and sound feel to it and lacks any feeling of being a cheap mouse. It is a little small compared to other mice that I have gamed with, however, it more than makes up for with its lightning fast accuracy and sheer performance. With an amazing eight highly customizable macro enabled buttons, it has just enough button power without having too much or too little. I do generally find that the more complex mice which have many hundreds of buttons often become clunky and much more difficult to effectively operate for my large man-hands and fingers. However, the two side buttons and three top-middle buttons of theBloody A60 are well placed and respond very well to my presses, my only gripe in this regard is that the middle button 3 is a little far back and took some finger stretches to get back there the first few times. TheBloody A60 gaming mouse has a smooth sleek feel to it and rests well in most hand sizes, it certainly did in my friends and my hands. 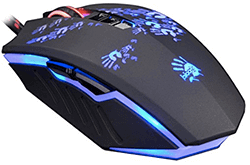 Its Metal X’Glide mouse boots give it a firm grim to the surface and the gamer an excellent amount of control. Also adding to feel of control are the perforated slashes on the sides, giving the serious gamer a better grip for those extended gaming sessions. All these features give one a sense of being one with your gaming mouse, a sense that relates well into gameplay. On ascetics theBloody A60 changing colors may become a little distracting after a while, I have heard that sometimes people become mesmerized by them, but they have an initial cool factor that nothing else will ever have. I would, however, imagine that they may not be epilepsy friendly, so some people should just be a little careful. 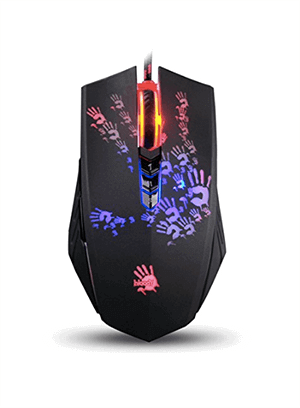 While the gripes are few, I do overall feel like with those specs Bloody is living up to their promise of bringing gamers the best gaming solutions and the nine years that they have spent in research and development has defiantly paid off in theBloody A60 gaming mouse. Paid off in your gaming achievements and my gaming achievements that is. I had one of the best gaming experiences with a middle range mouse while gaming with the Bloody A60, it performed much better than I had hoped or expected. I am actually looking forward o testing the next Bloody product that becomes available as I am sure it will be an awesome piece of gaming hardware.